The answers to Lataisha’s questions and some example photos from Pottery Barn are below. Take a look, you may get some good ideas or think “Oh crap, I have been doing this wrong all along.” I love hearing from all of you, so please send in the questions! 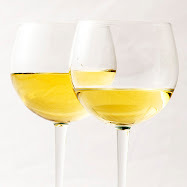 Lataisha, I can offer you some good tips and ideas. 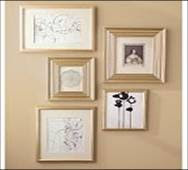 First, do you have enough wall space or enough pictures to group them in an interesting arrangement? I am talking about stacking them (you put one on top of the other, the smaller one centered over the larger one). That look of one large picture over the sofa on the main wall is very 70’s and I know you are up-to-date and stylish! If you have enough space, you can fill it up with a myriad of pictures, the frames do not need to match (as a matter of fact they shouldn’t) and the subject matter can be diverse too. I love it when clients use personal things to display on walls (not family pics) but pictures they have purchased on vacation or framed paintings of their former residences – that type of thing. And, don’t be afraid to mix media – watercolors, photographs, oils, and even dimensional pieces, like a large clock. One tip: do not “stairstep” art (meaning hanging 3 or more photos one gradually higher than the other) unless the art is actually going up the staircase wall, which is the only time it is appropriate. And please don’t hang these too far apart – you don’t need to use the entire staircase. 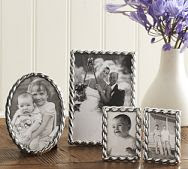 As far as family photos are concerned, you can group smaller ones in interesting frames on your end tables or sofa table. The larger ones are a little more difficult. Usually I recommend hanging these in a personal space, like your bedroom or den, or a bit out of the way like in the hallway. But if you have a few large ones that you love, they can go in the dining area or on a side wall in a main living area. Just don’t have them be the focus of the room. We all know we have the most beautiful children/grandchildren ever, but we don’t need to have large photos of them everywhere. One other thing that works well is to do an interesting mix on a wall - like buy a wooden shelf from Pottery Barn or Ballard Designs (pricier but very well-crafted and pretty) maybe in a couple of sizes – like one 2’ one and one 3’one. Hang them (the smaller one higher than the larger one) with enough space apart to hang a picture, and then “decorate them.” Put a few small family photos up and hang a couple of hooks from the bottom and hang something sentimental, like small things your girls have made. Then to fill out the area, hang other pictures, artwork, a clock, plates, etc. 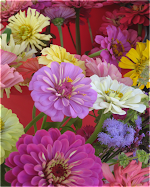 This method works great on a kitchen wall, powder room wall or in a hallway. 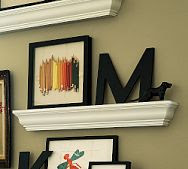 If you are doing it as your main wall in the living area, don’t use too many family photos, just your very favorite ones, or even ones of you when you were a teensy girl. Good luck Lataisha. Write back and let me know how it all turns out. Thanks for reading Becky Knows Everything.